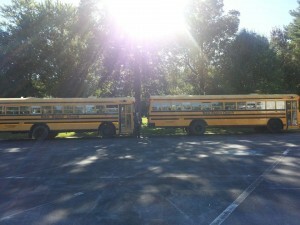 The Bus Ministry at Bible Baptist Church is an evangelistic ministry that targets children and their families. Adults and children ride the bus on Sunday morning to attend Bible Baptist Church. Every week we see people trust in Christ as their personal Savior who have ridden to church on the bus or van. We Thank the Lord for the opportunity to allow us to have the bus ministry to serve the people of Crossville and Cumberland County. Our faithful workers go out visiting on Saturday’s to try to encourage children to ride the bus and to witness to their parents. It takes a lot of effort, but it is well worth it to see people saved and growing in the Lord! For a ride to church please call 931-707-5514.